What Do I Do With These Orchids? 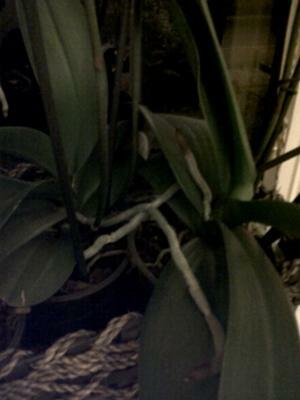 Hallo, I received these three orchids in December 2007, they had white flowers then. Since then they haven't flowered, but have grown (to my untrained eye) disproportionately. Can I trim them down? and if so, how? I just don't know what to do that's best, as I don't want to ruin or worst of all kill them. I have to admit that I have never re-potted them nor fed them, only watered. Comments for What Do I Do With These Orchids? Thanks for your comment. Sorry it's taken a while to reply. I am so much more comfortable now with my orchids, as I knew absolutely nothing before seeking your help. The good news is, is that I have another little one which I rescued from work and certain death, and now it has 4 buds, which I am estatic about. I will certainly keep you posted. You are welcome. I am glad I can be of some help. As I said getting them more light should be a help. California does have sunshine! You mentioned leaves that are growing at the top, and thought they might be babies. Your pictures were dark enough for me not to see this but if there is a little plantlet growing (leaves and roots, like a miniture plant) from the old flower spike, then yes, those are babies. "Keikis" actually is what they are called which is the Hawaiian word for babies. Congradulations!!! your a parent. So yes, you can and should repot them as well. Just wait until they are ready and large enough. The rule of thumb is that you want the roots of the babies to be at least 5 centimeters long before replanting. You would want to put them in smaller pots (again just a little larger than the root ball of the baby). With small young orchids they will need more water as you should put them in fine orchid fir bark not large or medium orchid fir bark. If they do not have any roots wait until they get roots. Leave them attached to the parent plant until the roots have developed well enough to live on their own without their parent. If the old flower spike is still alive then they get nutrients from the parent. For the orchid mix at your garden centre just make sure it looks like little pieces of bark. It should NOT look at all like dirt. That said some people grow Phals. in sphagnum moss which is fine. Different but fine. Do not plant your Phals. in anything that looks like dirt. Phals. need more drainage than that. Regarding fertilizer: You can get a balanced fertilizer at the garden centre. Just ask them what they recommend. When you use it for orchids, dilute it to one quarter to one half the strength of the label directions. Always water your Phals. first to let the plant uptake water before putting any fertilizer on them. I put my Phals. in the sink, run water over them a few times over say a 15 minute period. Then I water them with the dilute fertilizer. I keep meaning to write a page or do a video on repotting. Maybe I will get to it soon. If not, do not hesitate to write to me if you need more specific advice on repotting. Thanks for your email, it certainly is a help. They were in the lounge but are now on the kitchen window cill, yes the dull weather in the UK doesn't help at all, we certainly need some of your sunshine! The leaves that are growing at the top, I believe are new orchids, so I can re-pot these as well? Although at the moment, they don't look as if they have any roots. The garden centre near me has an orchid potting mix I can get. What about food? I've never fed them. Thank you for your offer, I will definately need some help when re-potting. Thanks for your questions. And especially thanks for your pictures. Pictures really help me a lot to see what is going on with your orchids. It is a little hard for me to tell from the pictures as they are a little dark but it looks to me like this (rather large) Phalaenopsis would benefit from being repotted and from, in general, being moved to a place where they have bright but indirect light. They look to me like they are some of the larger white Phalaenopsis. Even though the pictures are a little dark and hard to tell for sure, the leaves seem elongated, kind of long and skinny. This and the fact that they have not re-bloomed tells me that they would like it a little brighter. I can see what I think are quite long aerial roots and this is normal for Phals. as they are epiphytes and like to grow on the sides of trees in the wild with the roots out in the air. I would consider repotting each of these. I generally use orchid fir bark. Plant them in pots where the pot is well drained and about 2 centimenters larger than the cleaned up root ball. 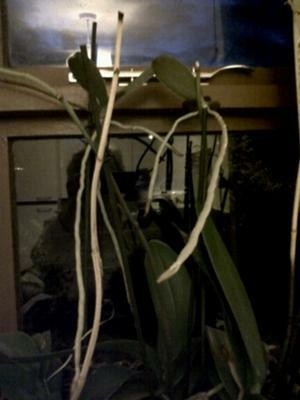 Generally Phalaenopsis orchids are not pruned, as such. But you could gently wind the roots into the media. Generally I do not recommend cutting the roots if they are healthy but yours look pretty large. So if one root was growing straight up and you could not fold it down gently by working it into the media when repotting it with out breaking it then it would be ok to cut it. But don't cut them if they only have a few healthy roots. Personally, I do not mind the aerial roots. They are just the Phalaenopsis being a Phalaenopsis. To me healthy roots equals a healthy plant. But you do want to cut away any dead or rotten roots when you repot. Use a new sterile single edged razor blade (or sterile technique) and do not use the razor blade on both rotten and healthy roots. If you can find them a slightly brighter place to live after you have repotted them they would like that better. Phals like 1500 footcandles if that means anything to you. I grow mine about 2 meters off a south facing window. No direct sun but bright light. But this is in Northern California. I think that it is more sunny here than in your area of the world. ;-). Go read these two pages on my site for lots more free infomation on orchids in general and Phalaenopsis in particular. If you need more help re-potting them contact me again and I will walk you through it.